In August 1997, I was heading down the fiord that led away from the Nunavik community of Kangiqsujuaq towards Hudson Strait in a canoe navigated by Jugini Irniq, an elder, expert hunter and guide. Large swells were bouncing our long canoe up and down. We were to meet up with an archeology team from Nunavik’s Avataq Cultural Institute who had spent much of the summer at Qikertaaluk island, about 70 kilometres from Kangiqsujuaq, at a place known as Qajartalik, home to the only major petroglyph or rock art site in the Canadian Arctic. For days, I’d been waiting in Kangiqsujuaq for this opportunity, but the weather had been wet, foggy and cold. I was on a tour of Nunavik to take stock photos of every community and prepare stories for the September launch of a Nunavik News section of the Nunatsiaq News, where I’d just started to work full-time. In these days, before rising airline and production costs lead to tighter travel budgets, I travelled around Nunavik with an Air Inuit card and hopped off in nearly every community as if I were on a bus. The tickets at that time were only slips of paper. No identification was required, and reservations could be made with the local Air Inuit agents who oversaw the continually changing passenger lists and air schedules. Also, thanks to the newspaper, I had a co-op hotel card that allowed me to charge hotel stays: After sleeping in tents and on couches or floors in Nunavik for years, that was a step up for me. Although the newspaper already had a website (updated only once a week), there was no internet in Nunavik (except through painfully slow dial-up connections) and no good digital cameras yet, so I took photos or slides to be developed later and kept a disposable camera with me for a backup. As for photos or slides, after being developed, those were sent to Ottawa where the Iqaluit-based newspaper was printed. I had been using a laptop (one of the first made) since 1991, and sent my stories by fax to Iqaluit or wrote them later in the office. This long-distance production routine was complicated, but overall, there was a much slower — and humane — pace of work than 15 years later, when the news would flow 24-7 and we constantly update our website. Then, there would be no time to spend so many days in a community, just waiting. But while I waited in Kangiqsujuaq, I got out and met many people, including elder, writer and teacher Mitiarjuk Nappaaluk. In the afternoons, I gathered mussels by the shore for my supper. After Jugini picked the Avataq team up at a nearby island, Assuukaaq, where students and archeologists had been excavating another site, we head over to Qajartalik, but the water became increasingly choppy. As a result, we only had a short visit there. 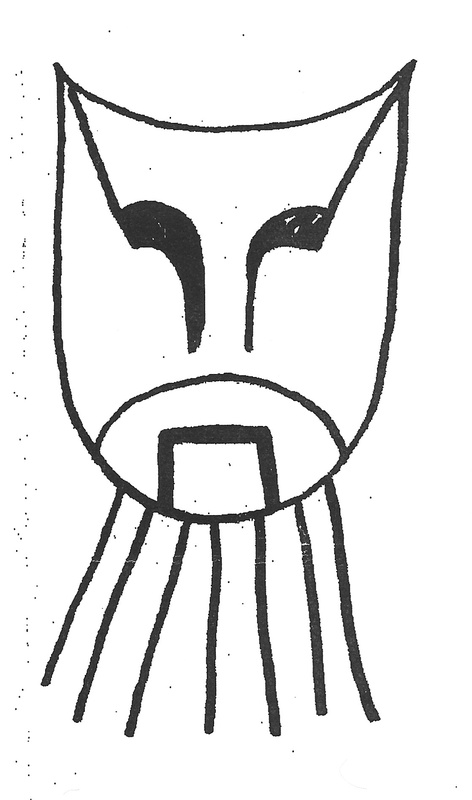 Bernard Saladin d’Anglure drew this image of a mask on Qajartalik for a paper that appeared in 1962. In shape, the etchings resemble the tiny carved masks archeologists associate with Dorset culture, believed to have flourished in the eastern Arctic 1,000 to 1,500 years ago. There were 170 of these faces, in several different shapes, carved into the outcrop’s soft soapstone. Precise methods were used in their production, Avataq archeologist Daniel Gendron told me — and most masks were symmetrical. Bernard Saladin d’Anglure drew this image of another mask on Qajartalik for a paper that appeared in 1962. 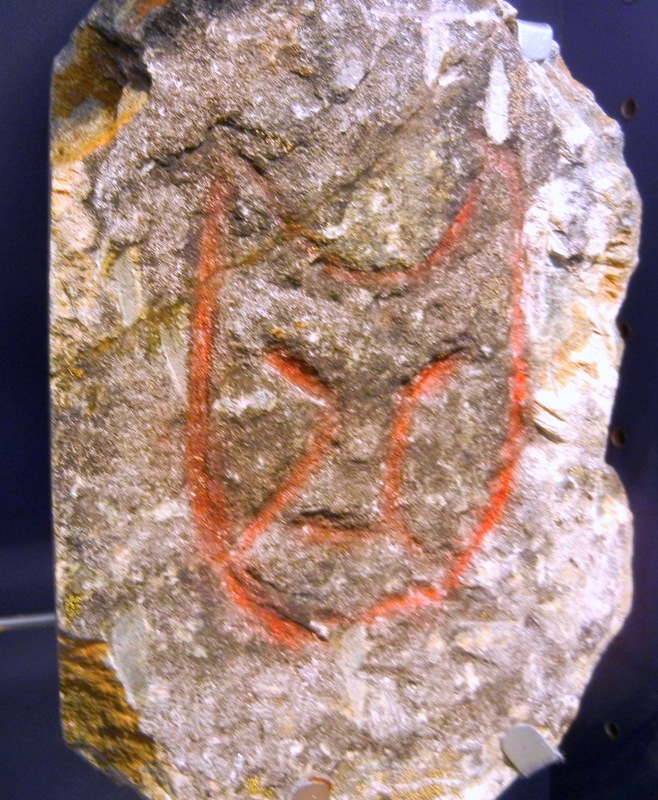 Some faces displayed feline features — and appeared to be horned. Lines radiated from many of the mouths, perhaps symbolizing the breath of a shaman, some speculate. At first the masks were hard to see: then the faces became clearer — and there were so many of them: spooky. “You can spend a day looking at those and you can’t see a face in one place and suddenly it’s appearing,” said Gagnon, whom I met in Kangiqsujuaq before I made it to Qajartalik. At Qajartalik, there was also a row of stones 60 m long, with two large stone circles at each end. 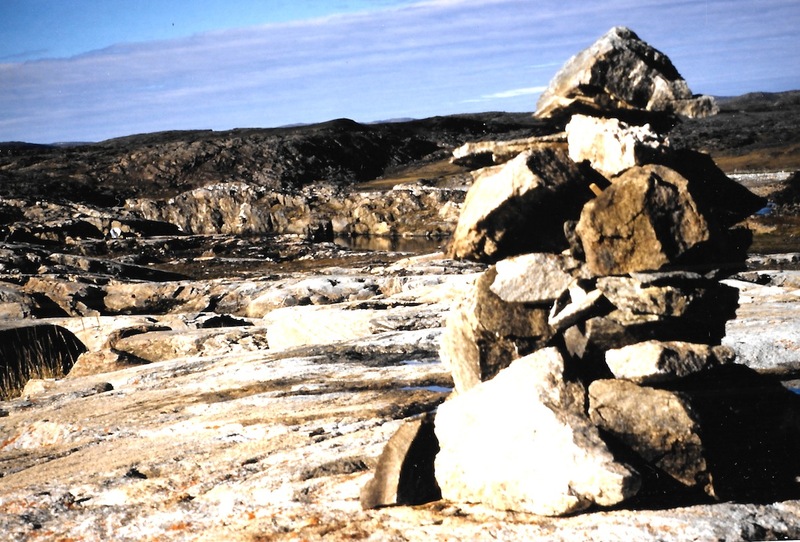 People in Kangiqsujuaq had always known about this mysterious island and at least one other rock art site in the area. Anthropologist Bernard Saladin d’Anglure first officially noted Qajartalik’s carvings in 1961. 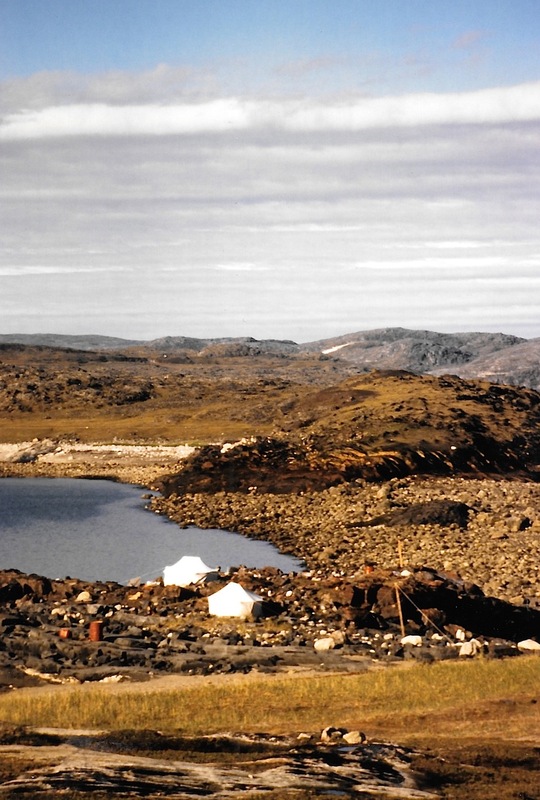 Researchers returned to the island in the 1970s, but people in Kangiqsujuaq declared a moratorium on further study after someone removed a block of stone from the island, which was later returned for display at the community’s Pingualuit provincial park visitors centre. In 1996, Avataq revived the research on Qajartalik, with its team of archeologists and rock-art experts finding new faces of various styles, as well as 40 places where soapstone pots or lamps had been carved out of rock. Despite their remote location, the masks of Qajartalik remained open to harm, they said, and, over the long term, natural processes such as water and wind erosion also threatened the site. In 1997, vandalism and looting had already caused damage. 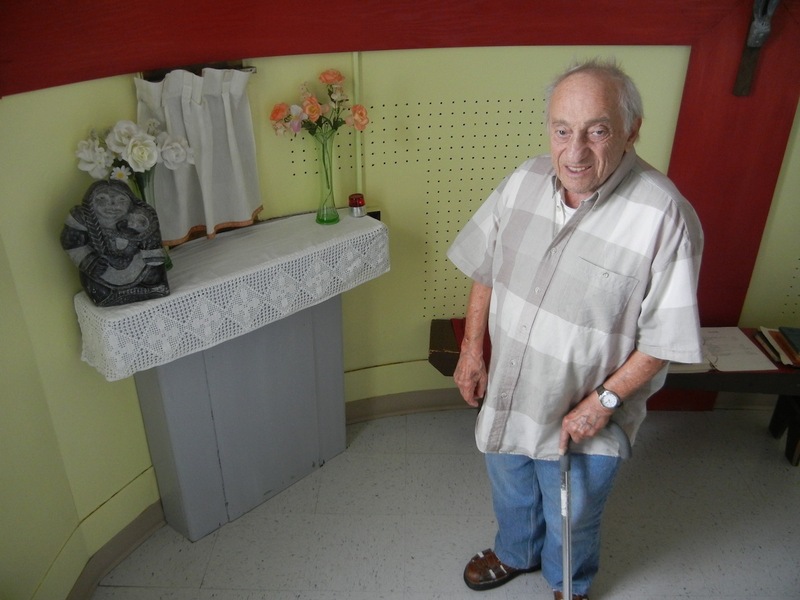 “It’s not because a place is isolated that it won’t be visited,” said Gendron. While Qajartalik’s location made protection a challenge, because it was an island, it was also considered to be federal turf, even though it was located offshore from Quebec. As a result, then — as now — it was hard to get Ottawa and Quebec City to agree on how best to protect the petrogylphs, or to offer funding for research. In 2014, a request to list the island as a national historic site still awaited a decision from Parks Canada. My relationship with Qajartalik did not end in 1997. In 2006, I learned from interviews with Avataq and Nunavik Parks employees that there was new evidence of vandalism and also that evangelical Christians could have desecrated the site. I then managed to enrage Gendron and evangelical missionaries who work in the Arctic. They emailed me and called the Nunatsiaq News office after I suggested in a story that there was a precedent for religious zealots destroying ancient relics. I mentioned how the tallest Buddha figure in the world was dynamited into rubble by the former Taliban government in Afghanistan. This story prompted Gendron to deny that he ever said he had any new information about damage at Qajartalik. After my brief 1997 trip to see Qajartalik, I spent the day looking at the archeological dig on Assuukaaq — where we spent a cold night — or I did, because my new, too-light sleeping bag feels like nothing in the middle of the night. Another bumpy canoe trip back to Kangiqsujuaq followed, and for a couple of weeks, I couldn’t turn my neck properly. I didn’t see Jugini, who safely helped us travel, again. But Jugini, who died of lung cancer in 2002, is remembered by many. Like an iceberg continues May 13.